Apparently there was once a building in the back lot, close to where I’m putting the orchard, and it seems that the bulldozers buried plenty of construction material when the lot was subdivided. I have dug up quite a collection of broken glass and crockery, bricks, fibro, nuts, bolts and even the odd horseshoe. When planting the more easterly cherry tree, I found the largest bit of debris yet – several bricks still cemented together. Digging them out by hand seemed too difficult, so one of the cherry trees has a sizable wall near its roots, invisible from above, but presumably a bit uncomfortable for the tree. Hopefully it won’t cause any problems as the tree grows. 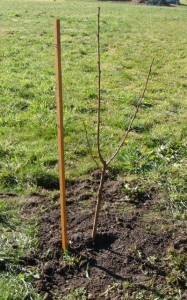 Both cherry trees have been growing nicely, but each summer they’ve been infested with slimy slug like creatures. Throughout spring the trees are green and leafy, with a few nice flowers and cherries even sprouting this year, but come December, and the slugs move in and eat their way through the leaves. I had been hoping that eventually some fearsome predator would stumble across the hoard of slugs and make a feast of them, but as yet, nothing seems to be interested in consuming the slimy things. Indeed, knowing what they smell like when crushed, I guess I’m not so surprised that there aren’t any takers. I now know that these slimy creatures are commonly called cherry slugs or pear slugs (I had no idea how close I was when I spent the last year referring to them as “those little sluggy things that have been eating the cherry and pear trees”), and that they are in fact the larvae stage of a specific type of sawfly. Up until now I have been simply spending a few minutes every other day crushing them with my gloved fingers – a smelly but satisfying process – but this year I have clearly lost the battle and there are next to no leaves remaining. The slugs have also been having a go at the pear trees (which makes sense, now that I know that they are called pear slugs as often as cherry slugs), and yesterday I spotted a couple on the walnut tree (which really was the last straw). A search of the internet has revealed lots of helpful articles (1, 2, 3, 4 & 5), and I am going to have a go at the wood ash suggestion (having fortunately only cleaned out half of last year’s ash from the pot belly). Dusting the leaves with wood ash is supposed to dry the creatures out, killing them without harming the trees. It apparently takes a few seasons to have a noticeable effect, so I probably won’t be reporting for a while on its success, or otherwise. Not many cherries, but thus far they are looking very good. A few weeks ago I spotted a couple of tiny cherry slugs on one of our trees. Having learnt from last season’s disaster, I immediately collected some ash from our Ultimate 500 and gave a light dusting to both pear and both cherry trees. Now, here we are three weeks later and I haven’t seen any more slugs, and our trees still have leaves. I’m cautiously hopeful that with a couple more applications of ash, the trees will remain unmolested. In addition to the reasonably healthy looking leaves, we’ve also got some tasty looking cherries developing. Sadly, only one tree has fruit, and only a measly three cherries at that, but even so it’s exciting. I should do something about netting them off (the branches, rather than the whole tree, as that may just be overkill for three cherries), and then maybe we’ll get to add them to our christmas feast. I think the low fruiting was due to some harsh weather we had when the trees were flowering. There was quite a rain storm at the time and near continuous gusting winds, blowing the flowers off the trees as quickly as they could produce them. I suspect the local bees took one look at the weather, and decided to stay home with their feet up. Additionally, I think the trees were still suffering from last year’s cherry slug infestation, and didn’t have the energy to put on a good crop. 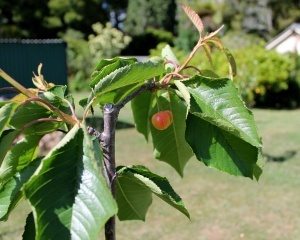 Anyway, it doesn’t matter, I’m still chuffed that we have three perfect looking cherries maturing in our garden. Hey, thanks for the mention in your post. I didn’t realise that the wood ash tended to take a few years to have an effect. I certainly have noted that it does have a short term benefit, but it makes sense that repeated applications will have the effect of reducing the population. So far the wood ash has certainly done the trick. While I’m generally happy to live-and-let-live with our many garden beasties, I was ghoulishly happy to see that the current batch of slugs had all turned into desiccated husks within a day. I had assumed that because there were so many of them, it would take some time before my efforts with the wood ash would manage to reduce the full life cycle of the population to a manageable level, but maybe I was being overly pessimistic with the few years guess. I’ll keep applying wood ash every so often through summer and autumn, and then see how many slugs show up next spring. 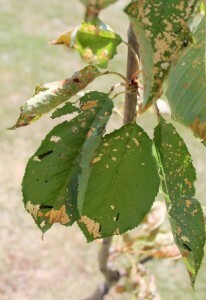 How do you deal with this issue on a very large ornamental cherry tree!!!!???? I can’t get the wood ash over the tree!!!! Hi Melinda, that’s a good question. I’m only the most amateurish of gardeners, getting by on eagerness rather than experience, so my guess is probably no better than your own. I gather the Sawflies lay their eggs on the leaves, these then hatch as the nasty, smelly slugs. When they have sufficiently gorged themselves on the leaves, they just drop to the ground, burrow in to pupate, then spring forth next season as new Sawflies. If you aren’t able to get to the leaves, maybe you could do something to the ground to kill off the pupae? Possibly raking through mulch regularly or putting down some sort of tarp when the slugs are at their peak? I gather few predators find the slugs palatable, but I find spiders tend to solve many pest problems. Let me know if you find a solution. Cheers.